Now enhance your preparation for RRB Group D through this RRB Group D Mock Test. These Mock Tests are well designed by the best Railway Experts. RRB Group D Mock Test and Practice Papers will help the candidates to prepare well for the Exams and get an Idea to understand the Exam Pattern of RRB Group D Exam 2018. RRB Group D 2018 Application Forms are over. Candidates who have successfully submitted the Group-D 2018 Application Forms can start preparing for the Group D Examination. However, the Examination Dates are not declared yet. 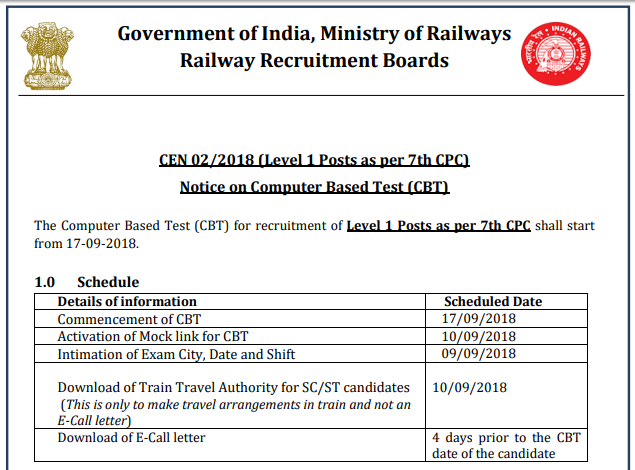 The Railway Recruitment Board will soon release the Mock Tests and Examination Dates. This, year the Railway Recruitment Board has made a record of receiving 2,80,00,000 application forms and out of which about, 2,12,00,000 candidates have successfully made the payment of the application fees. Due to this massive number of Applicants interested in the post, there will be tough competition between the candidates and so, there will be more pressure for the applicants to get shortlisted for the further rounds. In this article, we have shared some essential information regarding the RRB Mock Tests 2018, how can this be useful during the RRB Group D Exam Preparation 2018. RRB is going to activate the RRB Group D Mock Test Link on the regional website of RRB. Candidates can attempt the RRB Group D Mock Test Link from their respective RRB Zone. Railway Group D Mock Test will give a detailed explanation of the Subject Topics and Concepts etc. RRB Railway Group D Mock Test will give an idea about the Railway Group- “D” 2018 Exam Pattern. Through RRB Group D Mock Test you will get to know about the Answering Strategies, Time Management, Distribution of the Marks per section, variation in the cut-off marks and change in the Exam Pattern. Practicing the RRB Railway Group D Practice Papers will also improve your accuracy in answering the Questions. It also builds up the confidence in answering to the Questions in less time. The RRB Group D 2018 Mock Tests will definitely help you to crack the Examination. Therefore, think smart and practice these RRB Group D Mock Test. The Exam comprises of four sections- Arithmetic Ability, General Intelligence and Reasoning, General Science and General Awareness. The Exam Paper will be available in English, Hindi and 15 Different Regional Languages. The Total Number of Questions asked in RRB Group- “D” Exam is 100 and is each question carries 1 mark. Therefore the total marks allotted for the test is 100 marks. Total Time Duration of the Examination is 90 minutes. The Physical Efficiency Test checks the Physical Ability of the candidates. The Physical Efficiency Test is mandatory for all the candidates. In Document Verification, the candidate’s documents will be verified. sir please give help desk .to change exam city and time . some students have special problem .